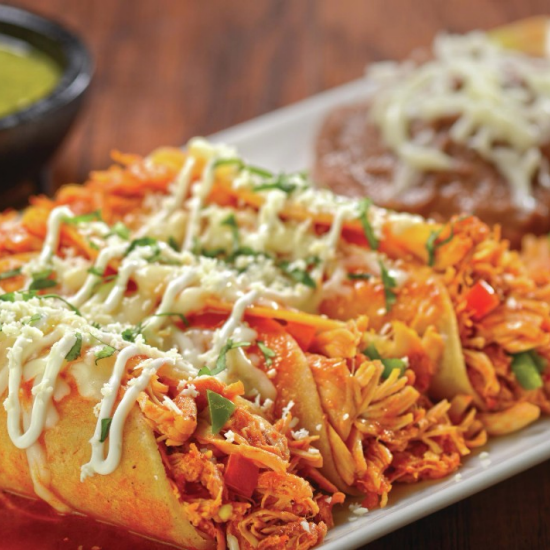 Spicy Southwestern fare can be yours at Gonzalez Y Gonzalez, featuring an authentic tequila bar. Saturday & Sunday 11:00 a.m. - 1:00 p.m.
Monday - Friday 11:00 a.m. - 4:00 p.m.
Let us get you a salsa pint to go! An 18% gratuity will be added to parties of six or more. Please let your server know if you have any food allergies. Not all ingredients are listed in the menu. *Thoroughly cooking foods of animal origin such as beef, eggs, fish, lamb, poultry, or shellfish greatly reduces the risk of foodborne illness. Individuals with certain health conditions may be at higher risk if these foods are consumed raw or undercooked. One of the finest tequilas made. Smooth and crisp. Aged for two and a half years in American oak barrels for a smooth and sweet finish. A classic for all tastes. 11 p.m. - 4 a.m.
Reventon with DJ RamZ spinning latin hits, pop, house & more. Locals receive 10% off your bill at Gonzalez y Gonzalez*! *Excludes holidays & special events. Not valid on alcohol. Must show state ID to server and/or management. Take the escalator to Casino Floor, head right towards the front desk. Walk passed the front desk towards the Century Elevators. Keep walking straight; you will pass Il Fornaio on the left walking into the Village Street Eateries. Head towards 48th & Crepe and at the end of the cobble stone walkway will be Gonzalez y Gonzalez on the left. Take the parking garage hallway towards the Big Apple Coaster and Arcade. Pass Nathans on your left and take the escalator on the left down to the Casino Level. Take the tile walking path to the left. Keep walking straight; you will pass Il Fornaio on the left walking into the Village Street Eateries. Head towards 48th & Crepe and at the end of the cobble stone walkway will be Gonzalez y Gonzalez on the left. If you are facing the front desk, take the tile walking path towards the Century Elevators. Keep walking straight; you will pass Il Fornaio on the left walking into the Village Street Eateries. Head towards 48th & Crepe and at the end of the cobble stone walkway will be Gonzalez y Gonzalez on the left.